Published: Dec. 10, 2012 at 09:18 a.m. Updated: Dec. 10, 2012 at 11:43 p.m.
Carolina Panthers defensive end Greg Hardy spent the week talking trash about the Atlanta Falcons, saying his team was better. The rest of the team reportedly was stewed that Falcons quarterback Matt Ryan was caught on camera last time telling the Panthers to get the (expletive) off their field in Atlanta. It all seemed a little juvenile and misguided for such a lowly team like Carolina. And then the Panthers backed up all the talk. This time, Hardy was the one telling Atlanta to "Get the (expletive) off our field," according to the Charlotte Observer. "You talk like that, you write that check. 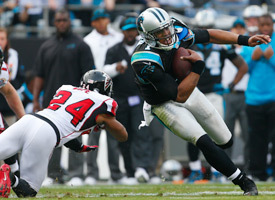 He cashed it," Panthers defensive end Charles Johnson said. "That's all you can do. You put it out there, you just back it up. And he did it." The Panthers scored on every possession in the first half. They had 16 first downs to build up a 16-0 lead on the way to a 30-20 victory. "I don't think they came to play. We did," Johnson said. "We were hungry. I think we just wanted it more than they did." This was the performance we expected to see out of Carolina more often. The Panthers are 4-9, but they have a franchise quarterback who has accounted for 11 touchdowns and no interceptions over the last month. One game isn't going to save coach Ron Rivera's job. Three more just like this, however, could do the trick.